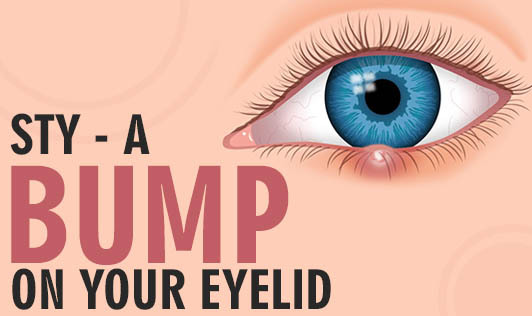 A sty which appears as a little bump on your eyelid is nothing but a minor bacterial infection. It usually looks like a pimple and is tender to touch. Sties’ take a few days to develop and normally drain out and heal on their own. No special tests are used to diagnose a sty because a doctor will be able to tell just by looking at it. Applying a warm compress over a sty provides relief. Do not pinch or pull a sty; let it heal on its own. Although sties heal in a few days, they might recur in some people. If a sty doesn't heal in a week's time, consult an eye specialist. If your eye is red or if there is bleeding or excessive tears, meet your doctor immediately. To prevent sties, touch your eyes with clean hands. Do not share towels, napkins, handkerchiefs with another person. Keep a safe distance from a person who has a sty. Do not share cosmetics or cosmetic brushes, pencils, etc. Wash off make-up before you go to bed at night and sleep with a clean face.